The largest PC maker in the world unleashed a volley of "multimode" laptops in Berlin, including two new members of the IdeaPad family. Lenovo today announced a pair of new IdeaPad Flex laptops powered by Windows 8 which offer 10-point multi-touch in two different ways. Starting at $799 (roughly UK£512, AU$875), the Flex line offers 14.1-inch or 15.6-inch display options that flip 300 degrees into "stand mode," bringing the 1366 x 768 or optional Full HD 1920 x 1080 touchscreen display closer to the user. Both models also act as traditional laptops which can be configured with up to fourth-generation Intel Core i7 processors and a maximum of 8GB RAM and 500GB hard drive, with SSD storage options also available. Lenovo's IdeaPad Flex series promises tablet-level battery life of up to nine hours, with the Flex 14 weighing in at a mere 4.4 while maintaining a svelte 0.85-inch thickness. 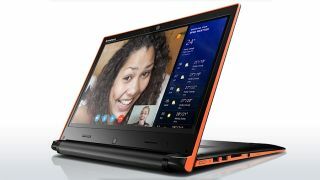 The Flex 14 and Flex 15 also includes Lenovo's own voice-activated YouCam software, which allows users to say "one, two, three, cheese" to snap a photo using the built-in webcam, then send it to loved ones without ever touching the keyboard. Available with a soft-touch black cover trimmed in either silver or Clementine Orange, the Flex laptops feature a 16:9 widescreen display perfect for watching movies through the included HDMI output, complete with Dolby Advanced Audio v2. Two of the four preconfigured Flex 14 models are now shipping in the U.S., with the Flex 15 expected in mid-September; Lenovo has yet to announce international pricing or availability. Get a closer look at Samsung's upcoming Galaxy Gear smartwatch in our hands-on!